I honest to God don’t know. Can one say what one is? How does one define one’s own sense of being alive? I think it is this hum, or buzz, blah blah blah blah blah blah, that keeps on talking inside one’s head. A stream of babble. The inner voice that never, never, never shuts up. Never. What is it saying? One can’t listen; if one listened, it would be, I think, the moment just before death. Cynthia Ozick from an interview in The Paris Review. A year of meditating, for the most part. I can't help myself: I look for accomplishment and what it's all meant. I give myself a good talking to. If you're looking to accomplish something, Lori, you're not really meditating. Life isn't easy, but meditation is simple. And so, my journey begins. February 25, 2012 Thoughts creep. Lee says that meditation lets you be more aware of the synchronicities of life. I wonder if I am afraid to be even more aware than I already am. Ever since Barry, my first husband, died, I have been suspect of coincidence and accident. I certainly don’t believe that everything happens for a reason. Stupid crap happens. But I see connections and gaps where most people do not. This is never particularly convenient. March 1, 2012 Lee told me that the stillness allows one to see others more clearly because one sees oneself more clearly. I await clarity. I look at myself and see the same person I have always seen. That person who struggles and lacks the ability to live up to her own standards, as a writer, as a friend, as a carnivore without much of a food conscience. But, I have been successful at preserving twenty minutes each day (oops, yesterday was only ten) and trying my best to halt thoughts. March 2, 2012 I told Lee about the wonderful night’s sleep I had after the first time I meditated. The restful sleep has not returned and I’m disappointed about that. Beginners’ luck? Lee told me the first time she ever went bowling, she scored 175. That was her all time high and was before she understood how difficult it was for a woman to bowl a 175. What can we accomplish when we are not dictated to by our failures? March 3, 2012 I have clumsinesses. There are awkward untoward comments that replay in my mind over and over. There are dropped coffee cups and broken glasses, and once there was a dumped pan of lasagna at a dinner party. There are forgotten birthdays, sympathy cards unsent, sarcastic emails mistakenly dispatched to a stepson’s teacher. I had an expectation that meditation would make me more gracious. A person who didn’t do so many boneheaded things. It would make me aware of stuff going on around me that I’d never quite tuned into before, things that other people seemed to manage so effortlessly. Meditation would clear my mind and I would be able to slow down my words and my actions. I am meditating and I am still me. March 6, 2012 I have much to think about, but I need to think about nothing. March 20, 2012 Last week, Lee told me a story of a seeker who set out with a shaman. They walked for many miles in a desert surrounded by mountains. The shaman had the seeker carry a card table. In the middle of the desert, the seeker set up the card table and put certain objects on the table, objects that represented his life. The two walked out of the desert and stood on the mountain. The shaman asked the seeker to look for the table. The seeker could no longer see the table, but he knew it was there, somewhere in the middle of the desert. The next task was to retrieve the table. March 21, 2012 Because I’m a writer, and have always had a dramatic flair for a story, I very much relate to something Lee explained to me about the difference selves within each of us. There are three parts to me: me the actor, me the narrator, me the witness. The actor is the person who goes about the daily business of life, doing the things I do and even thinking the thoughts. But the narrator in me is the person who judges (and harshly, I might add) everything I do and don’t accomplish. She provides the running commentary in my head. The witness is someone I’ve only recently become acquainted with. The witness is the the calm, non-reactive meditant who only appears for twenty minutes a day and to give her those twenty minutes is the actor’s duty. Sat, chit, ananda. March 23, 2012 Yet to accomplish nothing is to accomplish everything. March 31, 2012 If I counted the number of people I’ve pissed off or let down today, I would need to use two hands. April 4, 2012 Oh! Dried egg and flax seed on unwashed breakfast dishes. This annoyed me and I’d hoped today’s meditation today would wring that twisty angry feeling out of my insides. But the act of meditation is not one that takes kindly to commands. Not to mention that the perpetrator of the icky dishes decided to work at home today and was talking on the phone to a client (loudly) the entire time I was trying to meditate. What would the Dalai Lama do in a case like this? Oh yeah, the DL isn’t married. April 12, 2012 It’s difficult to say anything that would shock Roxanne, but when I told her meditation was a practice where the goal was to have no goals, she couldn’t believe it. ”Not even to make you more aware?” Nope, not even that. May 14, 2012 At the top of my swing there’s a millisecond where the club head is at a dead halt before gravity takes over and the club swings down toward the ball. It’s an inexplicable pause, a natural timing device that sets up the tempo of my swing. Blank time. This unstructured time is what the other players notice and admire. ”What are you thinking about when the club is up there?” they ask. I can’t answer. I don’t know. My mind is somewhere, but in a place I can’t identify. It’s an inexplicable pause, a little rift of time. That’s some sacred stuff. May 30, 2012 Yesterday, I awoke from a thumping and pounding on top of my roof. I mean loud thumps and pounds, as if a guy with a hammer was up there, banging away. Then, thwoosh. Outside of the bathroom window, a gigantic set of wings, brown and black striped, rush by over and over again. Then, I see the wings glide past the high window over my bed. A hawk has taken up residence very close to my home, probably on top of it. This is a big bird, a beautiful bird, but a large animal. My first thought is that I want it gone. I have a little dog, I have a head. Every time I go outside, I see this bird and it sees me. We stare at each other and the hawk is much less perturbed than I. He knows where he belongs. June 14, 2012 I talk about a lot of things with my friend Roxanne. I was friends with her before she became a doctor and I’m friends with her still. She listens more than she talks. A couple of weeks ago we sat together in the hospital room of a very sick friend. She was mostly there to support me. Our friend was sick, really sick, and I was nervous about seeing him. We talked, the three of us, about the things we cannot control and how the simplest things might be overwhelming and insurmountable. Roxanne said the only thing to do was to breathe. She said: I say the serenity prayer all the time. All the time. And it helps. She said: Lori writes a blog on meditation. I do. I told them that even though the blog is about meditation, I write about a lot of things because meditation is about everything. Roxanne asked me what I meant by that and I really couldn’t answer. I do know that meditation, like breathing, makes everything else possible. It connects my breath with my life with my goals with my passions with my anxieties. We sat there for a long while, the three of us, breathing. July 31, 2012 The whole process takes me twenty minutes. I use the first five minutes to breathe and relax my body, then I spend fifteen minutes encouraging myself to meditate. I say I encourage myself to meditate because even though I have been steadily sitting down in this practice for at least three or four times a week for the past five months, I still think that one day I’ll figure out how to do this thing right. That belief is not rational. No matter. still wonder: Do I meditate? I’m not sure. September 21, 2013 I’ve never been one to believe that everything happens for a reason. Stupid things happen and stupid things happen often. I try to figure out how to derive meaning from the meaningless; sometimes that works, sometimes it doesn’t. But ever since I began to meditate, I do detect a thrum beneath the surface of my everyday life. There are connections between things that should, by all logic, be disconnected. I don’t believe everything happens for a reason, but I do believe in synchronicity, not coincidence. When I’m most in need of a new perspective, the hawk flies across my path. One flew right in front of my car the other day, its wings just about grazing my windshield. What’s going on out there is connected to what’s going on in here. Whatever it is, it’s pretty wonderful. October 10, 2013 Meditatus Interruptus. Sometimes it goes like this: sit in my chair. Five or six diaphragmatic breaths. Imagine a light shining out from behind my eyes, my sinus cavity, my ears, my mouth. Relax my jaw, my neck, my shoulders and arms and hands, my chest, stomach, spine, both legs, and feet. Hear my mantra in my head and start to bring thoughts to my heart. See the light that is between my eyes and start to imagine that flowing down to my heart. Hear the phone ring. Take the call. Sit down again in my chair. Three diaphragmatic breaths, a quick body scan to re-relax, search for the light between my eyes. Remember the mantra. Back in. Dog barks. Dog continues to bark. Convince myself that outside noises can happen and I can still stay inside my meditation. Supreme concentration on bringing the light towards my heart. The dog barks. The door, next to my chair, that opens to the outside rattles. I open my eyes. A repairman is standing at the door and looking at me. I think he is more startled than I am. He apologizes for disturbing me and I let him in. I move to another room. I sit down on the couch. I take one breath, see the light that is my third eye, find my mantra, and sit. The dog barks. I sit. October 20, 2013 From a meditator‘s perspective: thoughts don’t pop into one’s head for no reason. October 24, 2013 I confess. 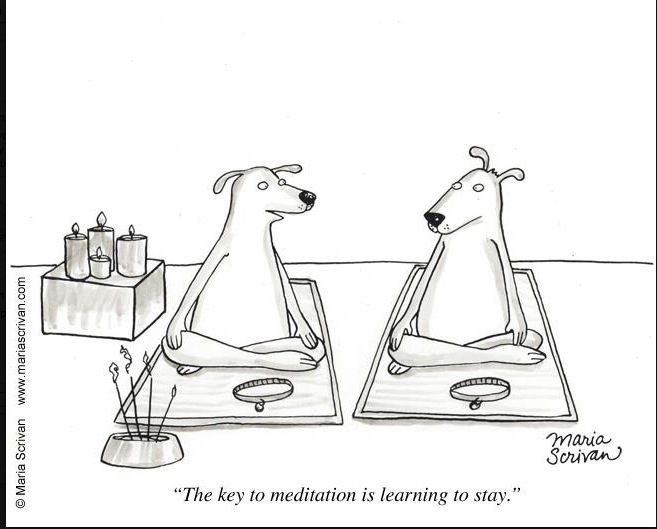 Something about meditation disappoints me. Eight months ago, when I first started to meditate, I was thrilled to experience burst after burst of awareness, change, revelation. Trippy. Synapses were firing and connecting all over the place. Clarity was mine. No way in the world I would ever give up this process that unmuddled the muddle of my mind. I’m still a believer. Meditation is a powerful tool. It has changed the way I look at the world and it has changed the way I look at myself. But, there have been no lightning bolt moments for many months. My meditation and I have settled into a comfortable relationship. I sit for twenty minutes daily and I find a level of contentment and satisfaction that inexplicably encourages me to try new things and be open to possibility. October 27, 2013 Gentle Failures. I repeat my mantra in my head. Over and over, Who Am I, Who Am I. But the thoughts in my head cycle around the mantra and pay it no attention. The thoughts form a new mantra. Fail gently, fail gently. I like the way the words sound; I am drawn to them. Gentle failures, fail gently. It goes round like that and I push the words out, but back they come, again and again. November 10, 2013 As Lee likes to say, she has been doing this for forty years, but every time she sits down to meditate, it is a new beginning. The beginning, or as I like to call it pre-failure, is the place of perfection. December 25, 2013 Rainbow within, The beauty is in the blur. January 27, 2013 I often wonder, do I really meditate? I never wonder, do I really levitate? If I did, I'd know. Floating up in the air, defying gravity with my mind: that there, boys and girls, would be a definitive answer.